I’m grateful to be a busy family guy with a steady day job but as a result this album was recorded off and on in fits and starts from 2009-2015 in untreated garages, corporate conference rooms and the tiny practice spaces of Bridgepoint Music. I think no project is ever truly finished, "done". At some point you just give up trying to make it perfect. My wife thought this seemed to be as good a time as any. Mostly out of necessity (and if I’m honest, a little bit of ego), I did all the arrangements, "grown-up" voices and played 93% of all the instruments myself. If it wasn’t me it was a computer sample. 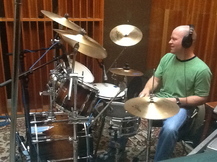 The project was recorded on a Mac Book Pro using either a Digi 003R+, 11 Rack or MBox2 depending on the part and location. Playing all the parts myself doesn’t mean I didn’t have help. 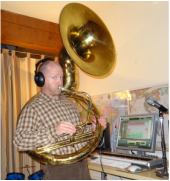 Richard Vaughn lent me many instruments, a sousaphone, bari and alto saxophones, marching cymbals, a violin, etc. 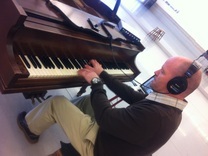 Sarah Jane Measor let me use her baby grand piano in studio 1 at the Menlo Park Academy of Dance. I want to give a big thank you to my wife Andressa for her support/patience with me on this project. Thank you to all the children who lent their wonderful voices and personalities. Hopefully this is something people will tease them about for the rest of their lives. © Sesame Street 1975 written by Hadley, Donald J./ Luckey, William E.